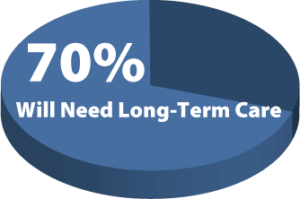 Long-term Care may be the most needed, yet least purchased insurance. If you’re reading this, congratulations. We are living longer, fuller lives than our parents and grandparents. But our parts eventually begin to wear out and, while we’re still enjoying our life, we may need a little help preparing meals, dressing, bathing, etc. But that doesn’t mean that we have to be in a nursing home. Most of us prefer to stay in our own home – and that’s okay! Long-term Care plans will pay at a nursing home or your own home! And there’s nothing else that will cover long-term care – not Medicare, not Social Secruity, nothing (other than Medicaid). So be considerate of you future self and give us a call. We can craft a plan together that will fit your needs as well as your budget.